Google at its ongoing developers' conference Google I/O, announced the integration of Google Wallet (the company's online payment system) with Gmail, allowing users to send money directly within emails. The innovative feature, "payment-via-email" is aimed to boost the reach of Google Wallet service among other things. 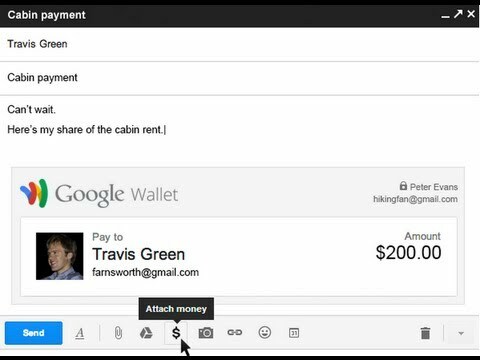 Google Wallet availability via Gmail means users can now securely send money to friends and family without the hassles of leaving their inbox. The service is free to send money if your bank account is linked to Google Wallet or you're using your Google Wallet Balance, according to the company's blog. While sending money using your linked credit or debit card attracts low charges. The feature will be rolling-out to Gmail users ages 18+ in United States in the next few months. And to activate, simply look for the $ icon in your attachment options. However, if your friends have early access and send money to you, you'll automatically get access to use the service.Whereas, without getting a payment from someone with early access to the service, you'll have to wait until the service have been rolled-out to everyone to activate. The company is hoping to drive more users to its payment service by this new feature and intend to make it go viral in the coming months.